These uniquely designed stoneware square bottom Mara Mugs make great gifts, especially for that individual who likes things out of the ordinary. 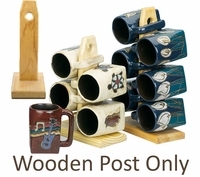 Of course, anyone would enjoy drinking their favorite cup of coffee or tea in one of these stoneware mugs. The flowers, birds and geometric designs all represent Mara's personal vision and display her unique perceptions of the world. Mara stoneware mugs are fired twice at high temperatures and finished by hand. Minor imperfections and color variations are therefore a common characteristic of hand-finished stoneware products.